In 1984 the Citizens Committee to Preserve the San Francisco Municipal Organ was formed. Spearheaded by organ historian Charles Swisher, the committee began an effort to renovate the instrument. Over a period of several years Schoenstein & Company (formerly Felix F. Schoenstein & Sons) began working pro-bono to restore the instrument to playing condition. Just as the restoration was nearly complete and the Exposition Organ was ready to be brought back into the spotlight…tragedy struck. 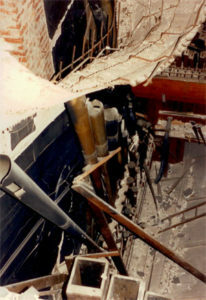 The wrath of the 1989 Loma-Prieta earthquake caused the back inner wall of the Civic Auditorium to crash down on the fragile pipework. Four feet of plaster and debris covered the floor of the huge pipe chamber. Unplayable and suspended in silence, the great Exposition Organ lingered in uncertainty…behind the velvet curtain. Two years of political discourse ensued as the fate of the historical instrument was debated in City Hall. The Civic Auditorium needed major repairs, so it was determined that the organ would have to be removed. FEMA funds had been secured and the Citizens Committee persuaded San Francisco to go forward with repairing the organ rather than selling it. A complete overhaul of the organ would be necessary. So in late 1991, the instrument was sent back to the Austin organ factory in Hartford, Connecticut. Seventy-five years after the great Exposition Organ was born, almost all of the 40-ton instrument was loaded into three tractor-trailers and moved nearly 3,000 miles back to its place of birth. The staff at Austin Organs, Inc. was very excited to undertake the restoration of this important legacy from their past. Work began right away dismantling windchests, stripping reservoirs, revoicing reeds and repairing and replacing damaged pipes. While work on the organ continued expeditiously, the large formerly occupied space in the Civic Auditorium was beginning to look quite useful to the city for other purposes. Several months after refurbishment had begun, a cease-work directive was received in Hartford. All organ components, whether whole or in pieces, were to be packed and shipped back to the West Coast for storage. The reason for the city backing away from the project was a combination of cost overruns on the Civic Center repair project along with the realization that the organ was occupying space that might be put to other purposes. The order was a bitter blow for the Hartford staff whose enthusiasm for the project was high. The shocking news was also felt throughout the nationwide organ community. Here was a historic instrument on the verge of a rebirth–having survived physical abuse, a major earthquake and the indignity of changing tastes–now to be relegated to certain oblivion. San Francisco historians and citizens were concerned as well. The San Francisco Fox Theater, considered to be the most elegant and opulent of all the Fox Theaters was lost to the wrecking ball in late 1963. The City of Paris Department Store, a beaux arts architectural master piece with its genuine Tiffany Dome, was lost in 1980 and The Fitzheau Building, the Train Station and several landmark hotels were also gone.